As many Blood Angles players have had to do, Scratch building Heavy Flamer turrets is a fun and challenging prospect, read: Crappy. 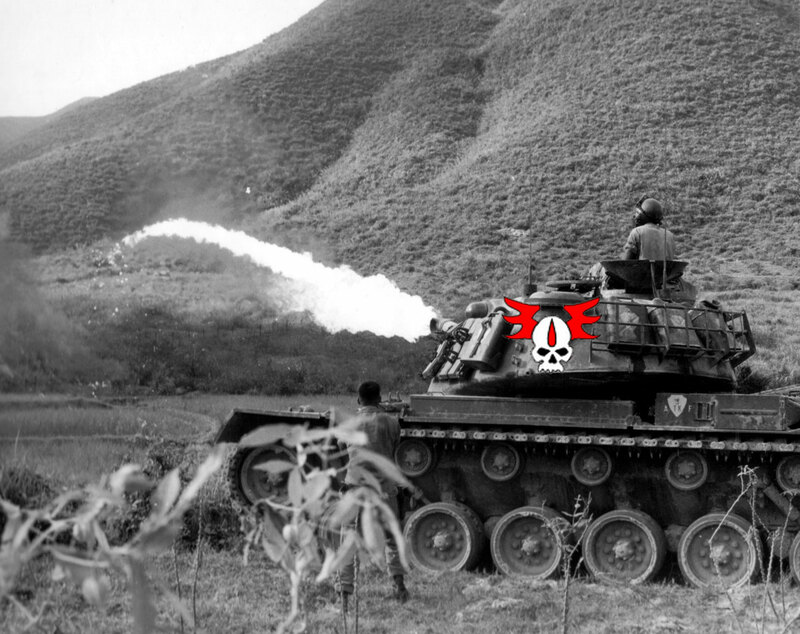 My best ideas that won't break the bank, revolved around the Flamestorm cannon. There are plenty of alternatives out there, the Imperial Guard Sentinel Heavy Flamer, creating a scratchbuilt flamer, plastic tube and plasticard based, or re-purposing the Baal Predator sponsons. Read on to see my solution. First thing: Baal Sponsons and Sentinel flamers were out of budget for me to buy bits for. That would have been 12 of them (2 for each turret x 6 razors). Scratchbuilt solutions can be done, I was able to scratch build Autocannons, but heavy flamers? That requires a bit more complex shapes, fuel hoses, promethium tanks, etc. ...No thanks. 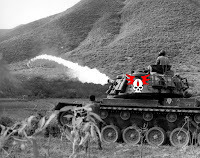 That brings me to the Flamestorm Cannons from the Land Raider Redeemer. Each sponson is a large two barrelled cannon, fuel hose, and twin Promethium tanks. 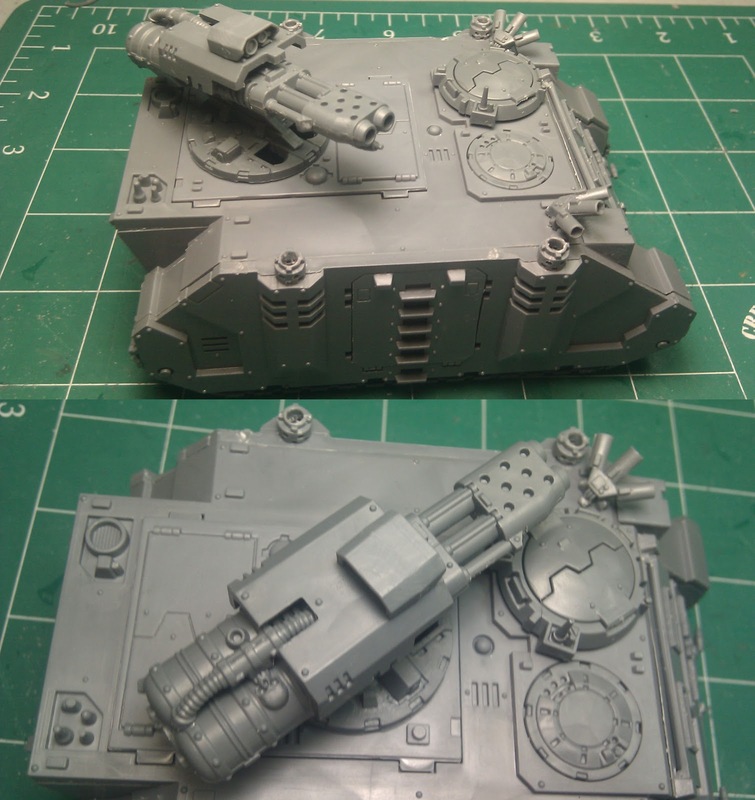 Plus, for each LRC kit you get two...for three kits worth you can bit out 6 cannons. I already own two from my own LRC kit, and found 4 more on e-bay for a steal. Flamestorm = Heavy Flamer? Yes? The key to conversion for me is that ever important, proof of concept. Because I already have all of my other turrets magnetized, so these should be no different. 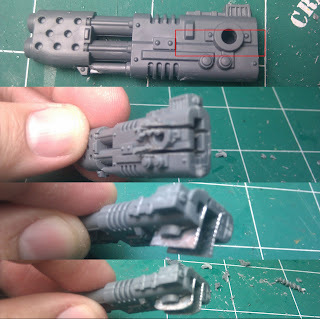 This requires me to magnetize not only the actual cannon, but the top cannon cover (the bit with the sensor and weapon cover, part of the turret) as well. 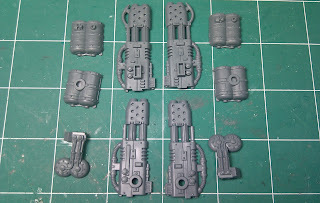 Firstly, here are the cannon bits from one LRC sponson sprue. 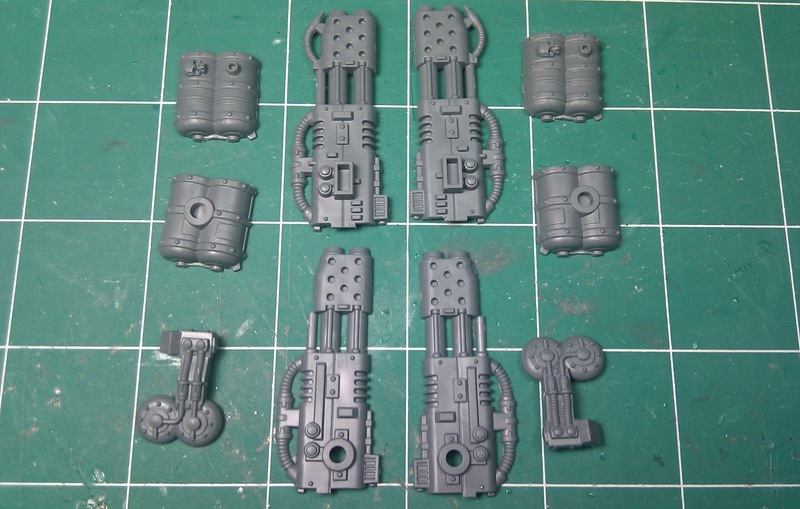 This consists of 4 cannon halves, 4 promethium canister sides, and two end cap/connector bits. Slice out the section with dremel/knife/burneing hatred, or just sheer willpower. *Always cleanup the space very thoroughly and dry fit the weapon mount for width. Slap in some sheetmetal squares, and line the area for the mount magnet to grab onto. Grind down the corners, and cleanup the sheetmetal edging. Next step, we put it all together. Flipping the cannon back over to the "top" side, I drilled a hole, mounted a magnet and began to place the hoses and tank in place, like so. The open end of the tank closes the end of the cannon, and the hose portion pops right on top in the gap between the tanks. The pic above should be pretty easy to follow. Flipping it over, we can add the pilot light on the bottom tip. We should have two pilots, but one in the center looks good enough for me. The cannon came with the one bit and looks pretty clean with the middle one if you ask me. ..and just like that, our cannon is pretty much done. If you are magnetizing, polarity is important. Always use your first magnet to set your second. Metal to magnet, is very useful, and should be tested and relied on in areas that don't have thick plastic, or lack space...Like the inside of a Flamestorm cannon! Slapping on the weapon cover/sensor, give us this. The last pic is the flamer slapped onto the weapon mount. It looks kinda thin from the side but I feel, it still conveys "Hey, I'm a flame weapon". What do you think? 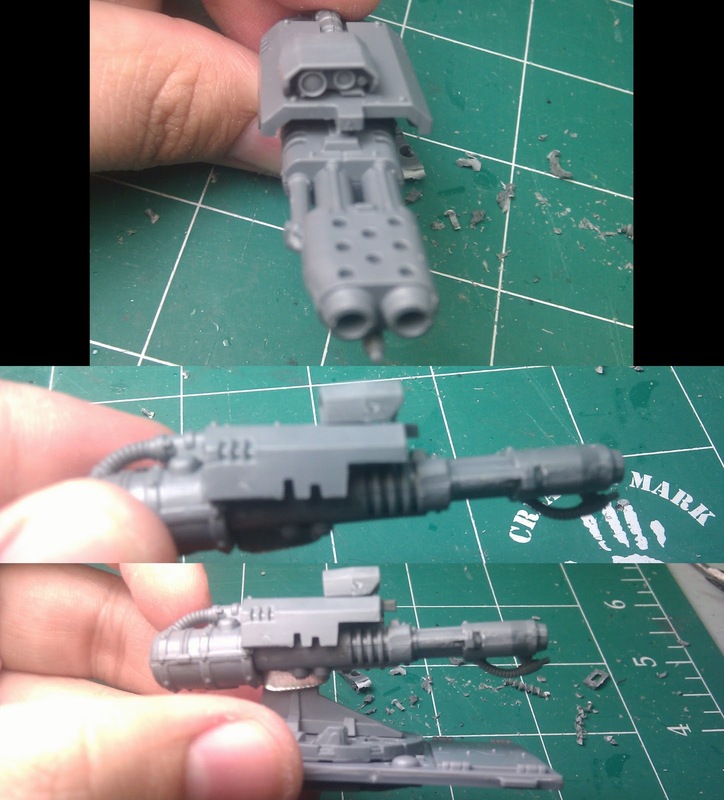 Also - you can see the magnetized hatch weapons (storm bolter and Hunter Killer) I have and the rhino hatch top there as well. Thanks for reading. I hope you liked the tutorial and can find some use from my project!